A beautiful vintage bureau from around 1930s with shapely legs and ball and claw feet. Offers lots of useful storage with 3 drawers and pull down desktop lid with painted faux leather insert in smokey grey, on wooden rests that pull out either side of the central drawer. Inside are useful desk dividers and a small internal drawer. 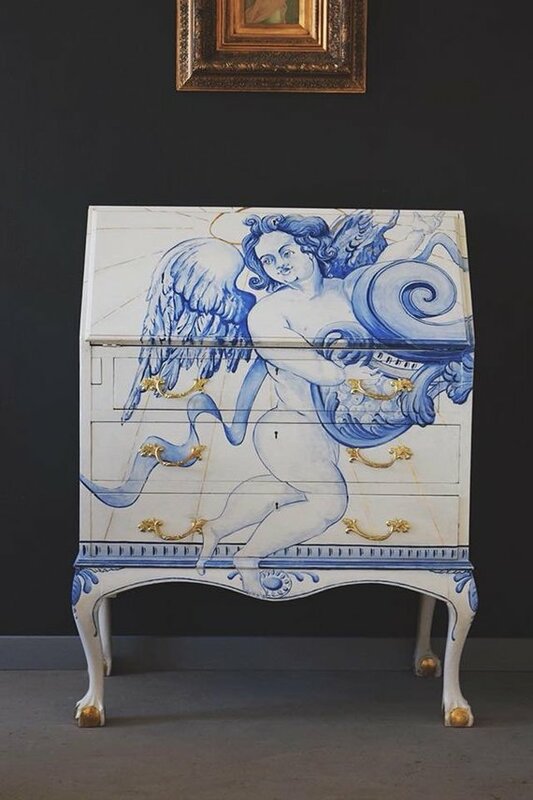 This item is hand painted by me in Annie Sloan Old White with angel motif in Napoleonic Blue, Greek Blue and Louis Blue, inspired by Madeiran ceramic tiles. Details are picked out in gilding paint to add to the celestial feel. This piece would make a stunning addition to a formal hallway or drawing room. The fresh, crisp colour palette works beautifully with blue and white crockery and tableware so sits nicely in a dining room or kitchen too, as a one-off piece of art. Due to its inspiration, it has a distinctly Mediterranean feel. As this is an hand painted and refurbished upcycled item it is not perfect, but I hope you will find its perfectly imperfect character adds to its charm! If you have any questions whatsoever please ask me. PLEASE NOTE: This item can be collected from my home in Lincolnshire, however if you require delivery then please contact me for a quotation based on your UK postcode for delivery within 14 days.